Paul Laidlaw meets Jim Telfer at the Greenyards. The Borders enjoyed further prime-time television exposure last week as the BBC One show Antiques Road Trip returned to the region. Hosts Anita Manning and Paul Laidlaw were aiming to turn a small budget into a fortune as they hit the road in search of both bargain buys and cultural insights. Anita Manning meets Dandie Dinmonts at Bowhill House. In the show broadcast last Wednesday and still available for viewing on catch-up, Anita began her hunt at Kelso Antique Centre, spending £80 on an old oak box and a propelling pencil. She then headed on to Borthwick Trading Antiques in Hawick, where she admired a £4,500 music box before settling for spending £100 all told on a knife box and marketing box. Paul, meanwhile, visited ABK Antiques in Innerleithen and purchased a miniature silver sailing boat from Malta for £55 and a miliary fob watch for £15. The rest of their bargain-hunting took them outwith the Borders to Dumfries and South Lanarkshire, but they did have time to see other sights around our region. Paul visited Melrose to meet former Borders, Scotland and British Lions rugby player and coach Jim Telfer to hear about the history of rugby sevens, started in the town in 1883 by Jedburgh man Ned Haig. Paul got his hands on the original Ladies’ Cup before donning the famous yellow and black jersey for a run about on the pitch with the current Melrose squad. He told Jim: “You have said many times today how lucky you have been, but I suspect that the boys and men you have coached were as lucky. Anita paid a visit to Bowhill House near Selkirk to find out more about its links with Dandie Dinmont terriers in a chat with estate caretaker Calum Flanders. She is shown inside the Georgian mansion, where she admired an 18th century Thomas Gainsborough painting of a past duke of Buccleuch before taking to the lawn to meet members of the Caledonian Dandie Dinmont Terrier Club. Sarah Richardson, visitor services manager at Bowhill, said: “We were thrilled to be part of the recent episode putting a spotlight on the Borders. 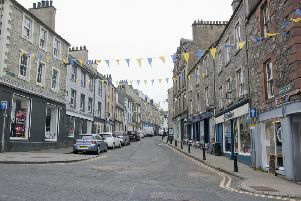 Last year the Antiques Road Trip visited DC Dalgliesh in Selkirk, the Old Melrose Furniture Studio and nearby Border Reader bookshop, Hawick’s Borders Antiques Centre and Eptas Arts in Kelso. Other notable visits include Abbotsford House, near Tweedbank in 2011 and Duns in 2015.